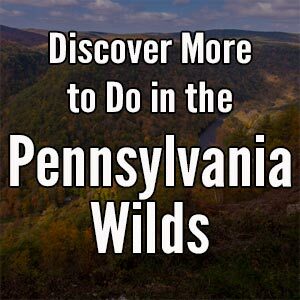 Brookville, Pennsylvania, is a quaint borough along Interstate 80 and the seat of Jefferson County. 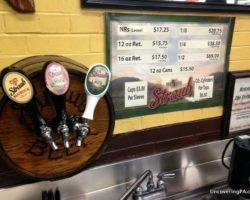 From a superficial look, it doesn’t appear much different than the other communities in northwestern Pennsylvania (minus being where many Major League baseball bats are made). 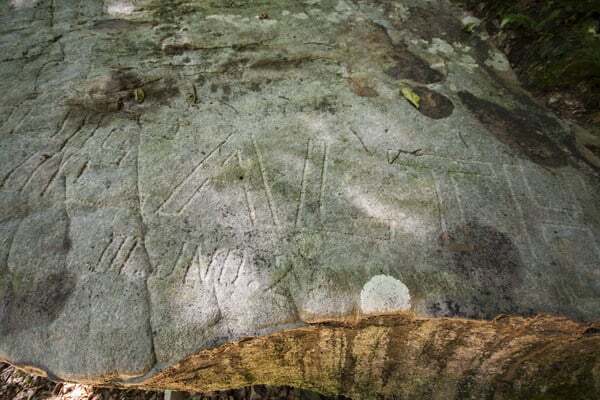 However, scattered around the wooded hillsides on the outskirts of town is one of Pennsylvania’s biggest oddities: the Scripture Rocks. 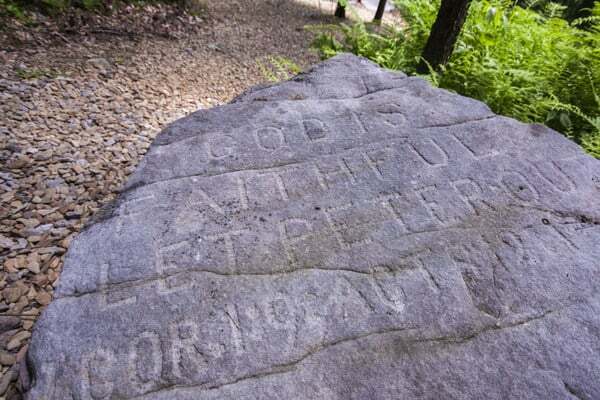 The Scripture Rocks are a collection of dedicated and carved rocks made by local preacher and eccentric, Douglas Stahlman, in the early 20th century. Stahlman grew up in Jefferson County and later moved to Tennessee and Indiana. 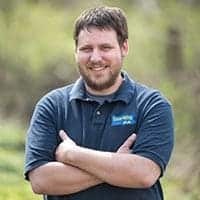 While in Indiana, his wife died of blood poisoning after Stahlman dismissed the doctor, choosing to rely instead on his faith to heal his wife. When his wife died in 1901, Stahlman’s children were taken away from him and he was declared insane. He eventually found his way back to his native Jefferson County, settling in Brookville. His religious fervor hadn’t changed, and he began praying at secluded rocks. Eventually, his prayers led to a vision of dedicated rocks around the outskirts of town. In 1909, with the help of friends, he began building chapels near some of these rocks to hold outdoor worship services. However, when his past deeds were found out, most of his friends and followers left his side. Living by himself in a home atop a rock that he dedicated as Altar Rock, Stahlman began to inscribe many of the 500 rocks that he had dedicated over the previous four years. By the end of July 1913, he had inscribed 165 rocks with letters between three and thirty inches in height. Altar Rock was home to Stahlman’s open-air chapel and his home. After inscribing his final rocks, Stahlman disappeared from public record for two years, until he was jailed in September 1915. While in jail, Stahlman was deemed insane and spent the rest of his life living in an asylum. He died in August 1942. Whether Stahlman’s work was that of religious fervor, mental instability, or a combination of the two has been debated over the years in the community. 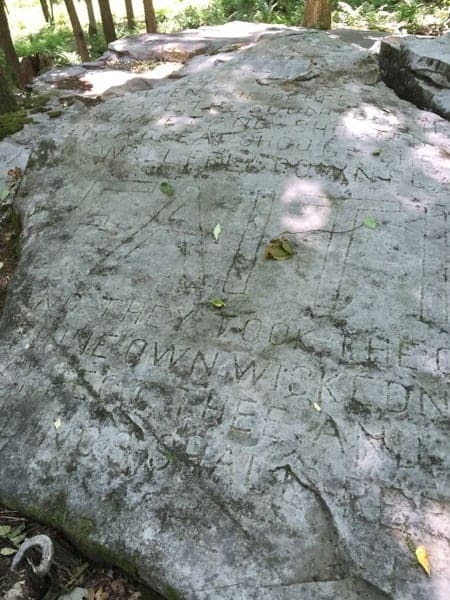 However, 100 years after being carved, the Jefferson County Historical Society decided that the rocks should be preserved and set out to create the Scripture Rocks Heritage Park. Stahlman’s Faith Rock shows his carving techniques. 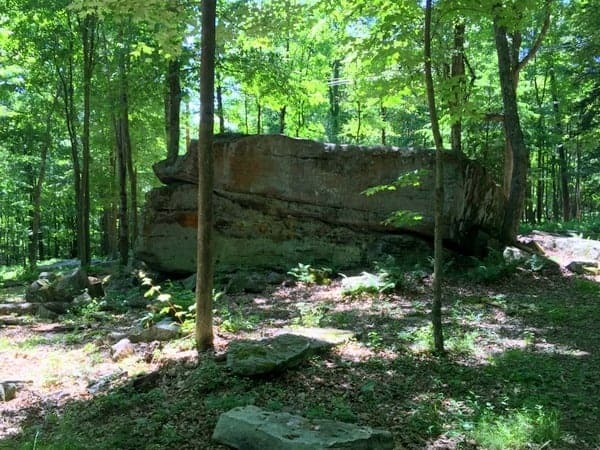 Located just outside of Brookville and only half a mile off of Interstate 80, Scripture Rocks Heritage Park was opened to the public in June 2016. 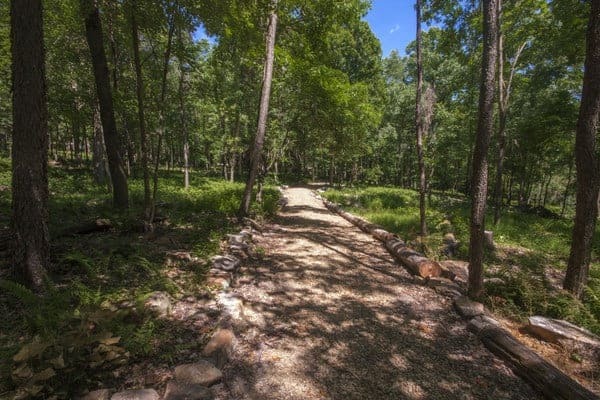 The park features 1.5 miles of walking paths that take visitors past approximately 65 of Stahlman’s dedicated and inscribed rocks. These represent 40% of the 151 inscribed rocks that have been found around Brookville. Unfortunately, most of the others are located on private property. The entrance to Scripture Rocks Heritage Park is off of Route 28 near Brookville, PA. I had the chance to visit the park less than two weeks after it officially opened to the public. 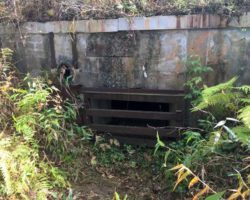 I was excited to see what had been done to preserve the site and see whether this new attraction was worth visiting. The parking area for the park is very nicely laid out, with the trail venturing off to the side and a collection of picnic tables near the road on the far side. 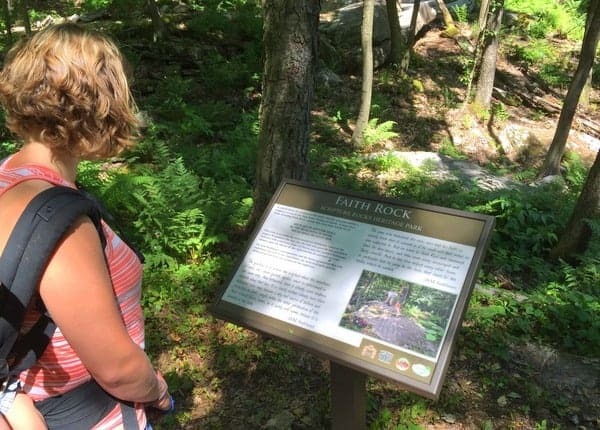 At the trailhead, there are several signs that explain the history of the rocks and a map to the five-acre property. Before leaving, consider picking up the brochure at the trailhead. It has a suggested donation of $1 and provides a wealth of information about the rocks, including the inscription on each one. I found this to be very helpful as it was very difficult to make out all but a few words on most of the rocks. The map inside is also a handy reference to keep your visit on track. One of the well-maintained trails through Scripture Rocks Heritage Park. A series of six brightly colored trails lead visitors around the property and provide viewing to the Scripture Rocks. My visit took me on a loop past most of the rocks, connecting the blue, yellow, light blue, and red trails together. Along the way, signs point out some of the most interesting rocks and give context to what they say. Signs also provide information on geology, flora, and fauna of the park. I found these signs to be especially interesting and made sure to alter my path as needed to read as many of them as I could. The signage at Scripture Rocks Heritage Park highlights some of the most interesting rocks and stories about the area. 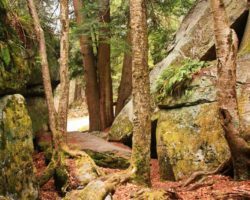 Among the many rocks in the park, the most important to Stahlman was Altar Rock. This rock was his first open-air chapel and where he eventually built his home. Surrounding this large rock are many of his inscriptions, though it doesn’t appear that he inscribed anything on Altar Rock specifically. Many of the rocks at Scripture Rock Heritage Park contain Bible verses. However, some include commentary about local pastors that Stahlman considered heathens. There are also several rocks where Stahlman declares a local woman to be his soul mate. This is the only rock that appeared to have been altered after the initial writing, which may have been done by the woman’s family. One of the easier to read Scripture Rocks. 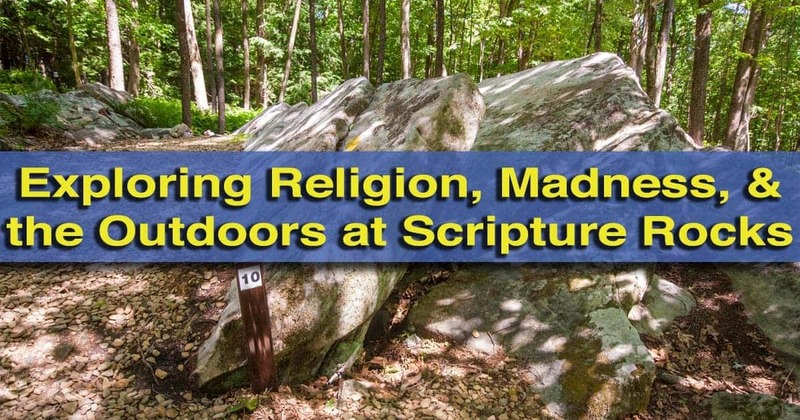 What I enjoyed most about Scripture Rocks Heritage Park was the combination of religious fervor and a little bit of crazy, mixed with the modern information that placed the rocks in context. It moved the rocks beyond a religious spot or a beautiful natural spot into somewhere that’s worth visiting. 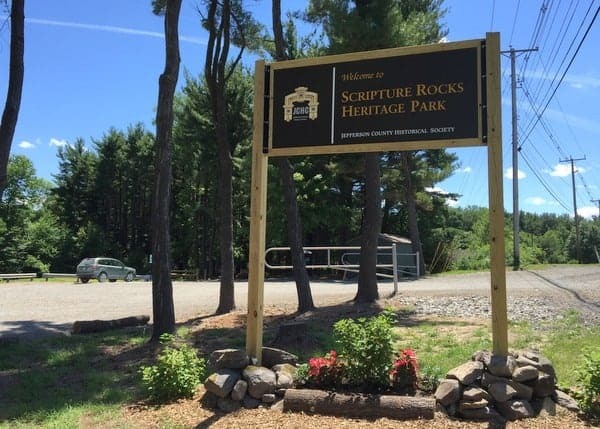 Whether you are interested in history, religion, nature, or are just looking for a nice walk in the woods while driving along Interstate 80, Scripture Rocks Heritage Park in Brookville is definitely worth checking out. 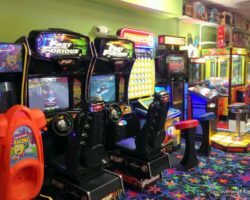 Looking for other things to do in the area? 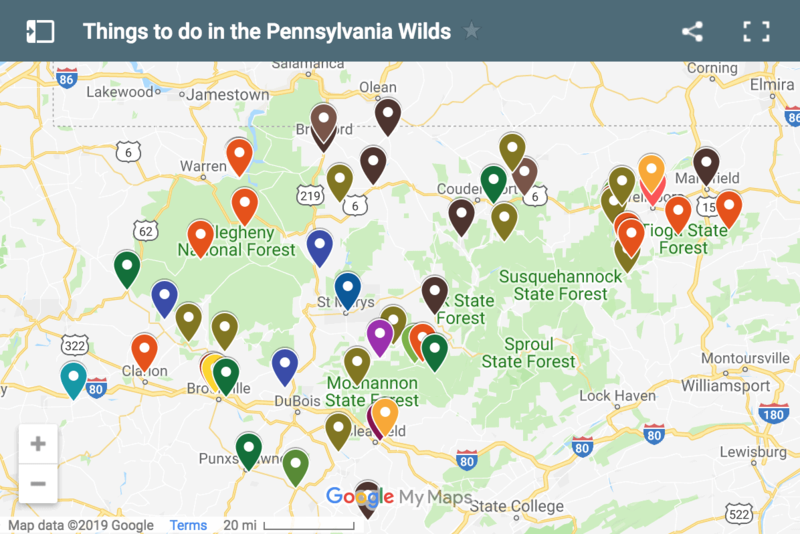 Check out Blackbird Distillery, Bilger’s Rocks near Clearfield, Rapp Run Falls in Clarion, Beartown Rocks, Clear Creek State Park, or Cook Forest State Park. Nice article – first I heard of this. We visited there this past summer after seeing a post from you. Very interesting place. Nice marked trails throughout. Paths are very easy to walk on. I highly recommend this place to visit.